The implementation of article 44 of the EU Regulation 1698/2005was transposed into the Portuguese law during the period 2007-2013.Although these effortshave taken Portugal to a leading position on this transpositionat anEuropean level, the expected increase of the Agroforest area in the country was not achieved. Reasons concerning this low success have been analyzedby EURAF and an audience was asked to the thePortuguese Ministry of Agriculture, Sea, Environment and Land Planning (MAMAOT) in March 2013. 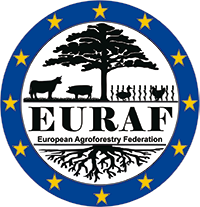 On the 5th of April 2013, EURAF had a meeting in MAMAOT with interpretations of the current legislation and identification of possible of obstaclesfor the unsuccessful measure in order to adjust it to improve the implementation of new agroforestry systems during the time of preparation of the new rural development plan.The meeting seemed to be constructive. EURAF resumed the meeting discussing points and sent to MAMAOT again. No further questions were made. The transposition of the EU Regulation1307/2013 into the PortugueseRural Development Plan is under process and a preliminary version submitted to Brussels has been released. This version is explicit concerning a direct reference to the implementation of the article 23 supporting the establishment of agroforestry systems and includes a specific “Action”for their support. Measure 2.3.2.2 from the previousRDPincluded both support to forestation of agricultural and non-agriculturalland, as well as support for the installation of agroforestryareas. The current RDP distinguishesthesetwo types of supports, and operation 8.1.2 is exclusivelydedicated to the installation of agroforestryareas. Minimum area allowed for applying for support was reduced from 5 hectares to 0,5 hectares. This value is important since around 75% of Portuguese farms have less then 5ha (corresponding to 11% ofUtilised Agricultural Area). Other operations regarding knowledge transfer at national and international level have been presented, and may allow for the dissemination of knowledge between countries. This may help the recognition and dissemination of new agroforestry systems in Portugal (for instance alley cropping etc) and the use of other species. The existence of a forest management plan is still compulsory, referring minimum of 25 ha and to the Regional Forest Territorial Plan (PROF). Therefore some inconsistency prevails on the minimum area. It is still not clear if maintenance support will continue to be incompatible with Single Farm Payment. Promover a criação de sistemas agroflorestais, nomeadamente montados, sistemas quecombinam a silvicultura com práticas de agricultura extensiva, reconhecidos pela sua importância para a manutenção da biodiversidade e pela sua adaptação às áreas com elevada suscetibilidade à desertificação. Apoio à instalação de sistemas agroflorestais de caráter extensivo, com recurso a espécies bem adaptadas às condições locais. Manutenção através de um prémio de manutenção até 5 anos. Elaboração de Plano de Gestão Florestal (art.45 e 35.) -Apoio à elaboração de Planos de Gestão Florestal para explorações individuais, para ZIF e para áreas agrupadas no caso da elaboração de PGF não associados a investimento, os mesmos são elegíveis apenas no âmbito do art.26. Ajudas concedidas sob a forma de subsídios não reembolsáveis. Detentores privados, municípios ou suas organizações, de terras agrícolas e não agrícolas. Custos de instalação incluindo materiais florestais de reprodução, análises de solos,preparaçãodo solo, regas, micorrização, mão-de-obra, fertilização, protetores individuais das plantas, ou redes de proteção e retancha. Prémio anual por hectare (durante 5 anos) - custos de manutenção incluindo controlo davegetação espontânea, podas, desramações, limpeza do povoamento. Custo deelaboração doPlano de Gestão Florestal ou de instrumentos equivalentes . Área mínima de investimento de 0,5 hectares. Deter comprovativo de comunicação prévia, para os projetos que se encontrem nas condições previstas no regime Jurídico de Arborização e rearborização (artigo 5o do Decreto-lei no96/2013, de 19 de julho)ou deter, quando aplicável, autorizações previstas na legislação aplicável, da autoridade competente, para a operação de florestação as decorrentes do Regime Jurídico de Arborização e Rearborização, da Rede Natura 2000 e Áreas Protegidas. Apresentação de Plano de Gestão Florestal (PGF) nos termos da Lei quando os investimentos incidam em explorações florestais ou agroflorestais com área igual ou superior à definida em PROF(Plano Regional de Ordenamento Florestal). Áreas com gestão florestal certificada por sistemas identificados pelo ICNF (Instituto da Conservaçãoda Natureza edasFlorestas). Áreas de elevada suscetibilidade à desertificação (PNACD -Programa Nacional de Ação de Combate à Desertificação). Áreas classificadas ou submetidas ao regime florestal. Ajudas concedidas sob a forma de incentivos não reembolsáveis até ao limite máximo de 2 500 000 euros/beneficiário (total para o conjunto das operações de 8.1.1 -Florestação de terras agrícolas e não agrícolas, 8.1.2 -Instalação de Sistemas Agroflorestais , 8.1.3-Prevenção da floresta contra agentes bióticos e abióticos, 8.1.4 Restabelecimento da floresta afetada por agentes bióticos e abióticos ou por acontecimentos catastróficos, 8.1.5 -Melhoria da resiliência e do Valor ambiental das florestas and 8.1.6 Melhoria do valor económico das Florestas). Apoio ao investimento -taxa máxima de 80%. Espécies florestais: Quercus suber, Quercus rotundifolia, Quercus faginea, Quercus pyrenaica, Quercusrobur, Pinus pinea, Larix spp.,Castanea sativa e outras folhosas e resinosas indicadas nos PROF como sendo espécies a privilegiar na constituição deste tipo de sistemas de produção. Espécies arbustivas: Arbutus unedo, Juniperus spp. Phillyrea spp., Pistacia spp, e outras indicadas nos PROF para as regiões em causa. Definição de sistema agroflorestal – superfícies que combinam agricultura com espécies arbóreas na mesma área e cuja densidade do arvoredo não ultrapasse 250 árvores por ha nem seja inferior a 80 no caso das folhosas e do pinheiro manso e 150 árvores/ha, no caso das restantes espécies. To promote the implementation of Agroforestry Systems, particularly montados, systems combining silviculture with extensive agricultural practices, known for their importance for the preservation of biodiversity and for their adaptability in areas with high risk of desertification. Support at the installation of extensive Agroforestry Systems, based on species well adapted to local conditions. Annual prize for maintenance support through a maintenance premiumwith a duration of 5 years. Elaboration of the Forest Management Plan (art. 45 and 35)-Support to the elaboration of the Forest Management Plan (FMP) for individual farms, ZIFs (Forest Intervention Areas) and grouped areas within the production of the FMP and non-subjectedto investment, those being eligible only under the scope of art.26. Private owners, local councils and related organizations, of arable and non-arable land. Installation costs including forest reproductive material, soil analysis, soil preparation, irrigation, mycorhization, hand labor, fertilization, plant protectors or protection nets and replanting. Annual prize for maintenance support per hectare (for 5 years) -Maintenance costs including the control of spontaneous vegetation and pruning. Costs associated to the elaboration of Forest Management Plan or similar management tools. Minimum area of investment of 0,5hectares. Broadleaves species and stone pine: 80 –250 trees/ha. To hold proof of prior notification for projects included in the legal afforestation and reforestation regime. (Article 5 of Decree Law nº96/2013, of July 19th)or to hold, when applicable, the requirements under the current relevant legislation of the competent authority, for the operation of afforestation, related to the legal afforestation and reforestation regime, Natura 2000 network and protected areas. To present the Forest Management Plan (FMP), under the terms of the law, when investments are made in forestry or agroforestry farms with an area equal or greater than the set in PROF (Regional Forest Territorial Plan). Areas with forest management certified by systems identified by the ICNF (Forests and Nature Conservation Institute). Areas with high risk of desertification (PNACD –Plan of Action to Combat Desertification). Areas classified or submitted to the forestry regime. Non reimbursable support granted until a maximum value of 2 500 000 Euros per beneficiary (total sum value given for operations 8.1.1 –Forestation of agricultural and non-agriculturalland, 8.1.2 -Installation of Agroforestry Systems, 8.1.3 –Forest prevention measures against biotic and abiotic agents, 8.1.4 Restoration of forest affected by biotic, abiotic agents or catastrophic events, 8.1.5 -Improvement of the resilience and environmental value of forests and 8.1.6 -Improvement of the economic value of forests). Investment support-maximum support of 80%. Forest species: Quercus suber, Quercus rotundifolia, Quercus faginea, Quercus pyrenaica, Quercus robur, Pinus pinea, Larix spp, Castanea sativaand other broadleaves and resinous species listed at the PROF as species to be prioritized for the implementation of these typesof production systems. Shrub species: Arbutus unedo, Juniperus spp. Phillyrea spp., Pistacia spp, and other species listed at the PROF for the concerned region. Agroforestry system definition –surfaces combining, within the same area, agriculture and tree species, where density of trees respects the following limits: under 250 trees/ha and above 80 trees/ha in the case of hardwoods and stone pine and under 150 trees /ha in the case of the remaining species.